At that time, these innovations included the installation in each guest room of a telephone with both outside and hotel service lines; suites with two bathrooms “allowing two people to take a bath at the same time and to be ready to go down to dinner together;” fitted closets; extra-wide corridors on guest floors to eliminate luggage grid-lock; fire alarms; and an elaborate dumbwaiter system to expedite delivery of hot food from the kitchen to guest rooms. The budget for design, construction and installations amounted to 60 million francs, representing in 1928 over U.S. $31 million. Opening rates started at 150 francs per night for a four-bedroom apartment with two bathrooms. 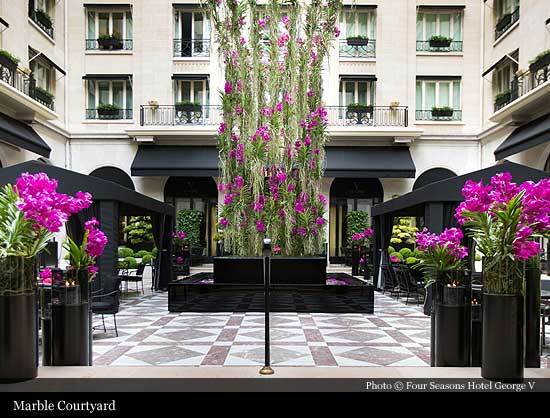 Located just off the Champs-Elysées, the original Hotel was designed around an interior courtyard fronting on Avenue George V, where the structure was kept to a single story; eight stories were created on the other three sides. Two more wings were added at a later date. The building’s foundations go deep into the site of former stone quarries, which also supplied raw material for construction of the Trocadéro. These quarries gave shape to the Hotel’s wine cellar, where one enormous stone slab formed the ceiling and stone walls provided solid anchors for the deeply riveted wine racks. The purity of the white stone art deco façade, with minimal architectural ornamentation, established the theme of simplicity and elegance prevalent throughout all elements of the Hotel’s design. Clean, crisp lines were atypical of the period. 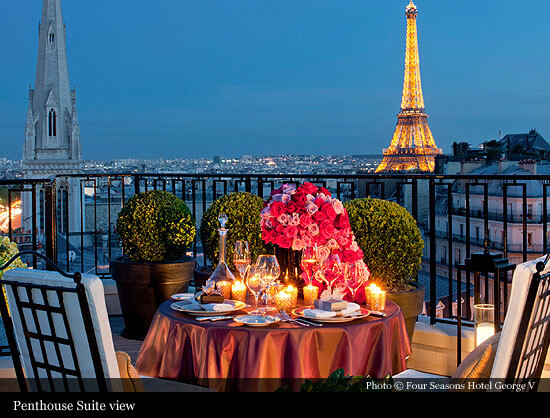 Quickly dubbed “modern French style” by the Paris-based Anglo-American press of the 1920’s, the Hotel’s architecture and décor drew admirers from the international design world. Also unusual for 1928 was the innovative layout of the main floor. The kitchens were set on the same level as the main restaurant, rather than below ground in the customary Paris hotel style. Equipped with modern refrigeration and ventilation, and with electric ovens in the pastry kitchen, they were finished with surfaces and facilities created to expedite food service and clean-up. The restaurant opened onto a courtyard, and offered a separate dining room for children, where nannies could tend to their needs and leave parents in peace to enjoy the most important business of the day. 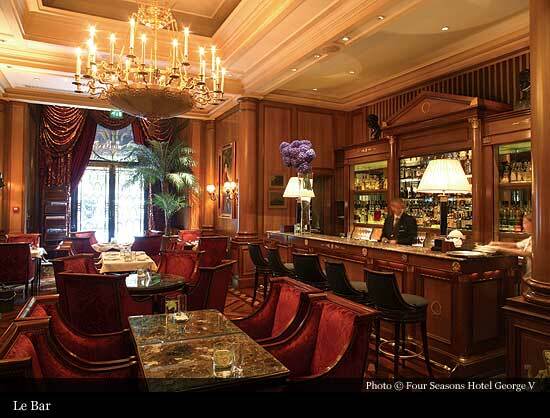 From the outset, the George V was an oasis of calm in the centre of Europe’s most sophisticated and busy metropolis. A garden on the roof of the reception hall and ballroom offered guests a quiet retreat, while various salons were dedicated to specific activities. 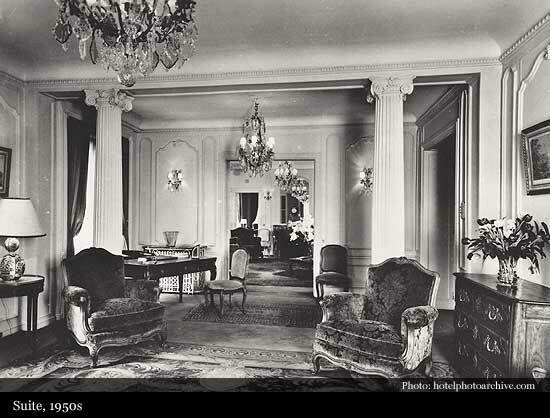 Among them were a tea room with Chinese décor, a smoking room, a barber shop and a beauty parlour. Known as the “Prince of Wales Salon,” the grand ballroom quickly became a favourite venue for Parisian society parties, and similarly attracted leading couturiers as the ideal backdrop to showcase the season’s collections. 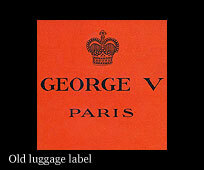 Among them, Yves Saint Laurent, Paco Rabanne and Louis Féraud have launched their confections here over the years. 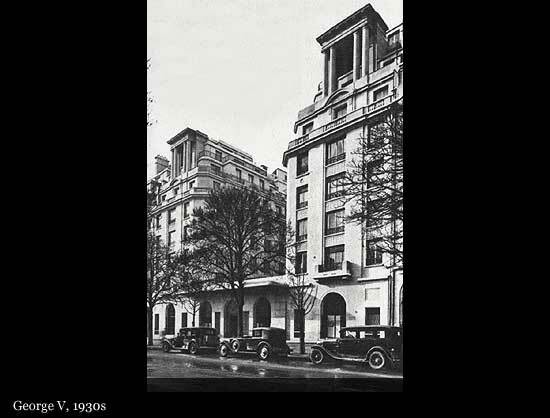 In naming the property, owner Hillman and his advisers eliminated the word “hotel” to achieve the image of a residence for visitors to the capital. 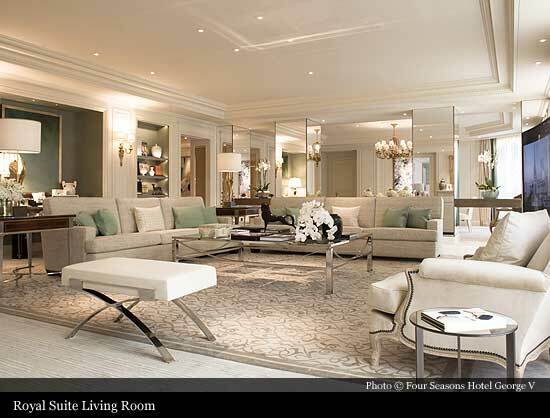 The objective was to offer a private home with a prestigious address and magnificent rooftop views of the city, and to provide comfort and dignity to a discriminating clientele of international business and leisure travellers. Among the early owners was François Dupré, husband of the Singer sewing machine heiress. For 25 years, Dupré called the Hotel his home and built a fine collection of artwork, which, together with the sumptuous fabrics and furnishings, made the name “George V” synonymous with the ultimate in taste, luxury and elegance. 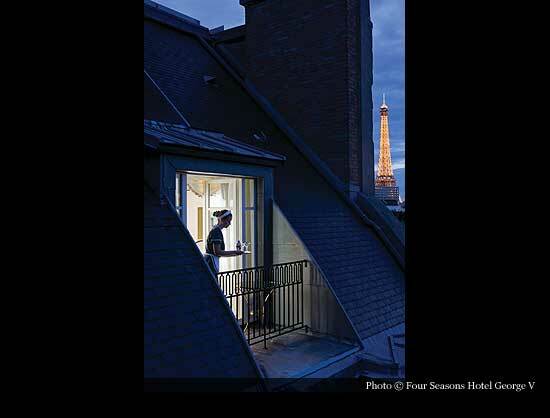 André Terrail, owner of the famous Parisian restaurant La Tour d’Argent and several establishments in the U.S., was the Hotel’s first manager and is recognised for introducing traditional American dishes to the George V’s menu selections. 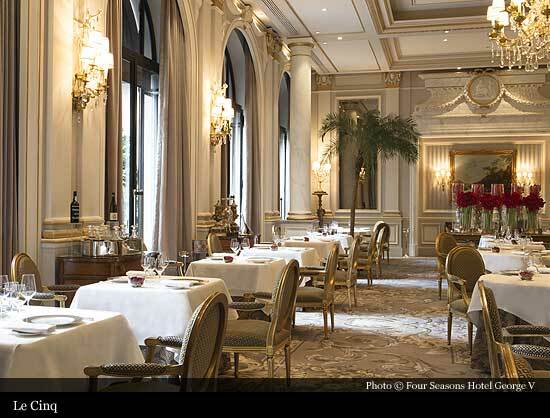 A famous Tea reception on May 25, 1928, marked the beginning of an illustrious history for the George V. On that occasion, some 100 financiers and members of Paris society gathered there to celebrate the launch of the Ile de France. 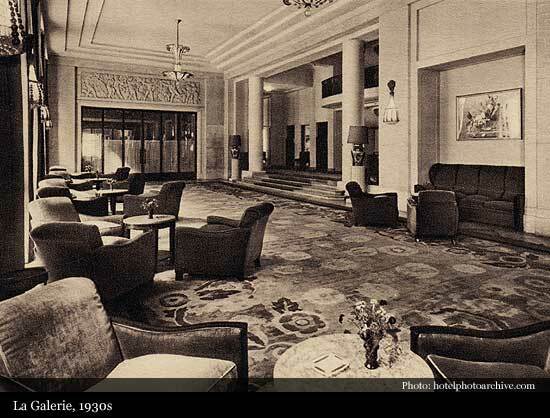 The transatlantic ocean liner brought to Paris an influential passenger list of wealthy American tourists and businessmen, whose patronage and recommendations would immediately generate long-term bookings for the Hotel. 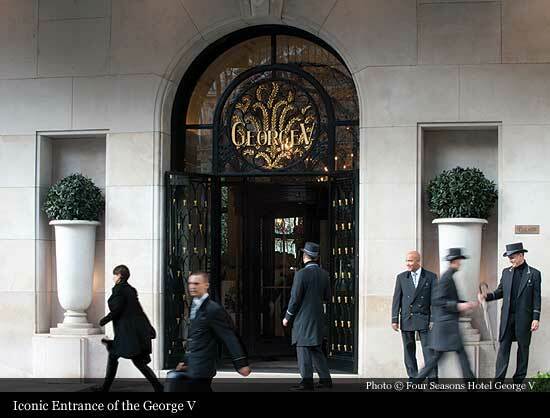 As word of this exceptional property spread, the George V became the chosen venue for numerous milestone events over seven decades of the twentieth century. In 1929, the George V hosted the signing of the Young Plan, outlining war reparation agreements, and was officially made a branch of the League of Nations. Famous American banker J.P. Morgan was present at this meeting. The year 1930 marked important service innovations. Chase Bank opened a counter in the building, facilitating on-site transactions for guests. The same year, the George V introduced air taxi service to and from London, Berlin and Madrid on a three-seater Farman, with transatlantic connections in Cherbourg. Shorter flights to Deauville, Le Touquet and select golf courses were offered on a Nierport, also a three-seater aircraft. In August 1944, the Hotel became General Eisenhower’s headquarters during the Liberation of Paris; later, as president of the U.S., he returned to pay homage to the great Hotel that sheltered him through those perilous times. 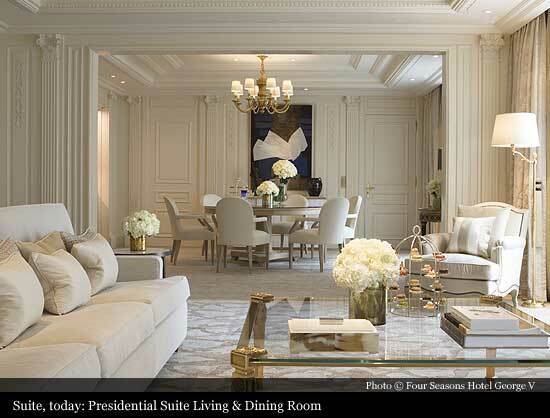 Other heads of state who have made the George V their Paris base for meetings include Presidents Valéry Giscard d’Estaing, François Mitterrand, Jimmy Carter and Richard Nixon. 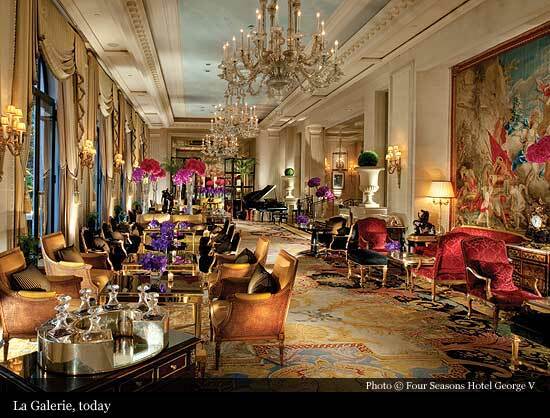 On November 1, 1997, Four Seasons Hotels and Resorts signed a long-term agreement with owner H.R.H. 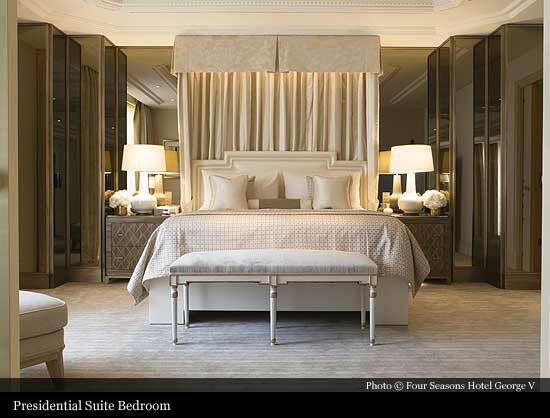 Prince Al Waleed Bin Talal Abdulaziz Al Saud of Saudi Arabia to manage the Hotel, now named Four Seasons Hotel George V, Paris -- the original name carefully preserved within the new one. 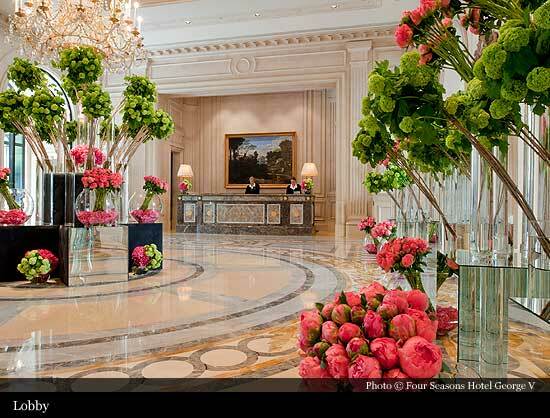 In seeking to restore the building’s key architectural features, and to re-create the original style and grandeur of this great Hotel, Four Seasons selected architect Richard Martinet and interior designer Pierre Yves Rochon to work on the U.S. $125-million renovation project. 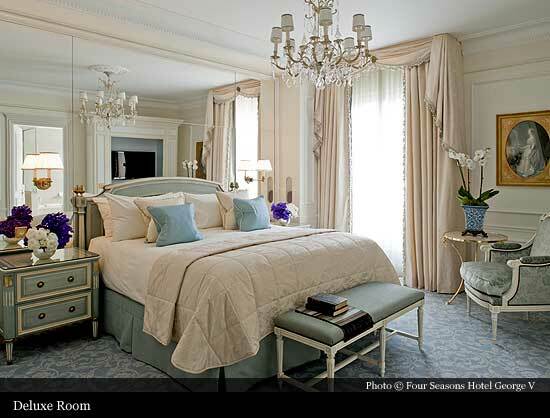 While the original charm was lovingly recaptured in the décor, a 21st-century infrastructure now supports modern technology and sophisticated facilities. A reconfiguration of guest rooms reduced the total to create unusually spacious accommodations, and new features include 13,000 square feet of luxurious meeting space, four dining venues, a 350-square-foot pool, modern Health Club, and full-service Spa. 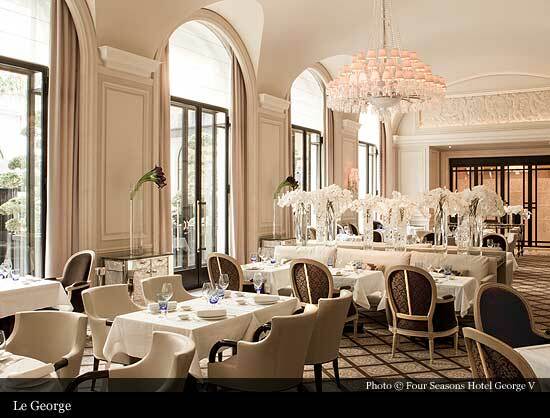 Four Seasons Hotel George V, Paris opened its doors on December 18, 1999, and celebrated its new incarnation as a leading Paris property and one of the world’s most luxurious hotels with a formal gala opening on March 30, 2000.